I love the Osaka Japanese Garden. I was introduced to it by Misuzu and Alvin, an amazing couple of mine, when we did their engagement session last year. It's a small and intimate garden, and it only takes a few minutes to walk through it. But the magic is not speeding through it, but taking the time to enjoy its beauty and design. LaRose and her siblings were only in town for the Memorial Day weekend and wanted to have their family portraits taken. I suggested the Osaka Garden and was encouraged/surprised to hear that LaRose had heard of it - it was pretty easy to schedule the rest of the shoot after that. I met the family that Monday and quickly connected with them. They were fun and willing to walk around with me as we went from location to location. I had a great time and it looks like they did too, despite the muggy 90 degree weather. You have to love the shade. By The Way - It's always a good idea to arrive early to the shoot. I was able to scout the area and find a few places to shoot that I hadn't seen before. The Osaka Japanese Garden is quickly becoming a favorite of mine. By The Way - The backdrop you see is actually a vintage rug that I flipped - the front is a lot brighter. I wanted these photos to be dramatic, so I used the darker side of the rug. I'm really digging it. By The Way - This shoot was kind of a last minute session. That's fine because working with natural light in the studio allows for a quick set-up: the backdrop, the natural light, and a reflector. Simple and effective. By The Way - Try to find out as much about the family's house you are about to enter beforehand. I took some allergy medicine before leaving for the shoot because I know that being around three pugs would cause my allergies to go nuts. I've had the pleasure of photographing the Russotiesi family about a year ago, so I was really excited to work with them again. I knew that the little ones would look a lot different and that's something that I was looking forward to seeing. Sure enough the kiddos were so much bigger and were even conversing with me. How cool! We met up at the beautiful Morton Arboretum in Lisle, IL. We simply walked around and hung out while I photographed them as a family and then as individuals. There really isn't a bad place to shoot around there - everywhere you turn there is a beautiful location/background. I was also encouraged to see that the Morton Arboretum had their outdoor art series happening that month. We were able to get some really cool shots near some of the installments. You'll see my favorite down below that says "You Are Beautiful." This family is beautiful and we had a great time. By The Way - I always say to stick to your gut when shooting outdoors. I was tempted to end the shoot early due to the kiddos wanting to go home, but I thought that one more location would be great if we could get their cooperation. The last portrait of the family came out of that last little push. Christmas Day is tomorrow, and in a flash it will all be over. The older I get the more I see Christmas as a time to spend with my family and friends. It's really fun and cool seeing my daughter open up gifts and dress up in her "fancy dress" as she calls it. It's also fun to see her in a Santa Hat... I couldn't resist the urge to take a bunch of photos of her in that hat. But this time of year can't just be about shopping and buying stuff for the people in my life. I hope to raise my daughter in such a way that she knows that this time of year is about giving to others and about spending time with the people that she loves. I can't believe that 2010 is just about done! Have a great Christmas everyone! By The Way: Christmas is also a time to make cool photos like this outdoors. Don't be afraid to step outside in the cold and make some photos. My approach towards children's portraits has changed this year. I'm still tempted to take really cute photos of babies and kids wearing funny/furry hats, and the like - I have done that in the past and really dig it. But kids are small adults in the making so I want to light them and photograph them in such a way. The idea has always been to clutter the scene with either a chair, a bunny rabbit, etc, in order to get the kids to laugh or smile and look cute. But with this photo shoot I wanted a totally minimalistic look, and so I photographed them on a white seamless background. I wanted the kids to be the center of attention and to stand out. I didn't want any visual distractions - just their expressions, either sad or happy, or whatever in-between expression they could give me. Plus, I really dig the timeless look that the white background gives. 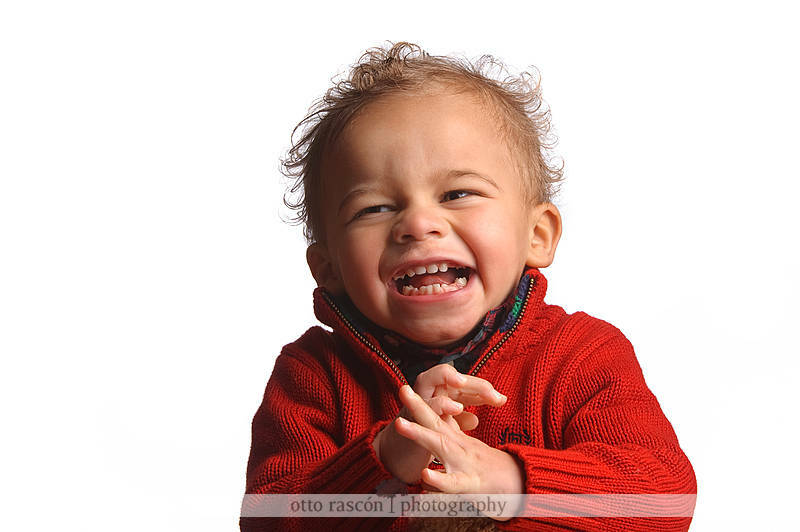 By The Way: A lot of patience is needed when photographing kids. And patience is needed when shooting on a white seamless background. There is a lot to juggle on this type of shoot: kids, tough background, lighting, and interaction with the kids and the parents. Be ready for an exhausting time, but a fun time nonetheless. Family portraits are really cool. Why you might ask? Well, I enjoy meeting new people and I also enjoy spending time with families. Seeing them interact with one another is a fun and there is always something to learn from the people I photograph. My family never got together for portraits, so it means a lot when families contact me and want to take portraits. My hope is that they will remember that photo shoot and that the photos I take will help them remember who they are as a family. So fast-forward to a few weeks back and to the Covington family portraits. They found me via a Google search and contacted me right away - gotta' love Google! We were able to schedule the shoot fairly quickly and ended up meeting at Kennedy Park on the cities south side. It was a really beautiful day, a bit on the hot side, but no one seemed to mind the heat and morning sun. It was fun for me to spend an hour or so with them. I just think that it's the coolest for a family to get together and make the portraits happen. So my many thanks to the Covington family! By The Way - Pretty much any location will work for a family portrait session. This session was in the morning and the sun was starting to get really bright and hot. There was also a good amount of construction going on all around the park, so finding the perfect location was a bit of a challenge. Trust your photographers intuition and shoot away! A good time for me involves a few things: cool balloons, a beautiful afternoon, good food, and taking portraits of a 4 year old full of energy. Thus, this shoot was a good time indeed. The portraits took place in Crown Hall at the Illinois Institute of Technology - I love the IIT campus! It's a great place to take portraits - it's peaceful and full of locations and amazing backgrounds. The coolest part of Crown Hall was Andy Worhol's "Silver Clouds" exhibit, as well as the Lego City exhibit. This made for an amazing and interesting photo shoot. Running through and around the silver balloons was a blast, and almost surreal. I could feel my imagination running at warp speed. Check out more of Crown Hall and the IIT campus. By The Way: Be a kid in order to take some fun photos of kids. I had a blast running though the balloons, and I am sure that Grace noticed my willingness to be a kid. Henry's 3 year photo shoot was a cool and chilled out session - just check out his Superman shirt and Keens! We, my family and his, met up at the Caribou Coffee on Lake St. and Oak Park Ave. We ordered some drinks and I started taking photographs, all while chatting and hanging out. I guess this could have been considered my first ever lifestyle session. After the coffee stop (no, the kids didn't drink coffee) we walked around the quaint Oak Park downtown area, where we found a few cool places to shoot. We then walked over to Scoville Park and finished the shoot there. The last three photos are from the park. By The Way: Shoot wherever the light looks best. There was beautiful reflective light inside the Caribou Coffee shop. I hadn't planned on shooting inside, but the light and location made for a great starting point to our session. Rock on! My daughter just turned 3 and I still cannot make sense of how fast that happened. I still remember my wife being pregnant with our daughter, and how special that time was. I remember how we would try to image our daughters face, or how her laugh would sound. Here are a few of my favorite photos from our shoot. We shot these in the beautiful Sunken Gardens on Homan and Polk St.
By The Way: Kids never seem to stop moving. So I generally move with them. But stick to your guns and get the shot that you envisioned. I plopped my Alien Bee and battery pack and shot away until I got what I wanted. Hattie is seriously a little cutie. This shoot was a lot different from her 3 month shoot, but a ton of fun nonetheless. She was just so easy to work with, and those hats were amazing! By The Way: Sometimes a very simple light set-up is all that is needed to create some fun photographs. Total time for this set-up was about 4 minutes, and total shooting time was abut 12 minutes or so. Rock on! By The Way: Patience is indeed a virtue. Photographing kids is a challenge, but the return on that energy/patience investment is amazing. Graduation season is upon us. It's easy to take this season for granted if you don't know anyone that is graduating. But if you have a family member or friend that is graduating, then it is a big deal. It's such an honor to be graduating, to be done with school, to have completed your studies. And what a perfect time to not only document this time, but to do so with a beautiful portrait! I am so privileged/honored to have spent time with these outstanding graduates and to have taken their portraits. What is even cooler is that they will forever have these photos of themselves on the day they graduated from college. They will be able to show these to their children, and for now can share them on Facebook and show their family and friends, with pride, that they have graduated. By The Way: Shooting in different environments is so much fun. Mickey's portraits were on location at Northeastern University. Edwardo's portraits were in my home-studio. Maureen and Dana's graduation portraits were taken in Forest Park. Different locations bring with them challenging lighting situations and we must be quick on our feet. I received 2 separate emails a few weeks back, on the same day, asking if I was available to do family portraits. Cool. Not a problem. Both emails were asking for the same type of portraits and then were asking if I was available for the same date. That was a little odd. I thought "hey, two family portrait sessions on the same day works for me." I come to find, a few days later, that it is the same family inquiring. Pretty funny stuff indeed. So that is how I met the Shannon family, a beautiful and warm family from Chicago. They were looking for both family portraits and graduation portraits, as both daughters were graduating from college. I was really excited about this shoot as it would take place outdoors and in Oak Park - 2 places I am fond of. The shoot ended up taking place in Forest Park, the park on Harlem Ave. and Lake St. But I digress. I was finally able to meet Maureen and her family - what a great group of people, and they all looked amazing! This shoot was truly a family event as my wife and daughter hung out with us as we photographed the Shannon family. This had to be one of the most relaxed and fun shoots in a while, and all thanks to the Shannon's. They were just cool, laid back, and fun to be around. I had my friend, the very talented Nick Wrzesinski, shoot with and assist me on this family session. It was awesome having Nick there to help with lighting and second shooting. He captured some amazing portraits! I really enjoyed this years Easter Sunday gathering: my mom-in-laws ham was SO GOOD, the weather was beautiful, and we had a Lamb Cake - yes, a Lamb Cake. It's not a REAL lamb, but it was a real good cake (there's a pic down below). It actually looked more like a cat than a lamb. I'm just sayin'. The family met up at my brother-in-laws house over in Flossmoor, IL. He and his wife recently purchased a really nice place over there. The house was packed and all of our kids made sure that there was not a silent moment all evening long. Seeing the kids dressed up in their Sunday's best was so cool - the girls looked so beautiful in their dresses and the boys were so handsome in their dress pants and shirts. They were all so endearing. My many thanks to my family for making Easter so much fun. It was kind of a quick evening, but it was a much needed one. By The Way: I had pre-visualized where I would be taking the portraits of the kids. I had thought it through and knew what I wanted. But then came the rain. It forced me to rethink my plans and I had to make some quick decisions. I really liked the trees in the background and I figured they would make for a nice background. I was so excited to be going to WPPI 2010. I knew that I would be learning a lot about my wedding photography business. I knew that I would meet some amazing people. I knew that I would see some amazing products at the trade show. I also knew that I would go to a few parties. But the one thing that I was really looking forward to was taking pictures! I pretty much had all of my gear - all of it. So imagine my elation when I saw Feuza Dos Reis photographing Christine and Iaan - a fabulous couple I had just met earlier in the day. You see I was on the 9th floor at The Signature (at MGM Grand) talking to my wife. When I looked down and saw the portrait session in progress. I told my wife I had to leave and RAN downstairs to where the shoot was taking place. I asked Feuza if I can shoot and she said yes. Sweet. I was so excited that I neglected to bring my lens bag. I only had my 80-200mm f/2.8 lens. Good thing that Feuza also shoots Nikon, so I was able to borrow one of her lenses. Christine Meintjes and Iaan Van Niekerk were an absolute blast to talk to and photograph. They are from Cape Town, South Africa, so I made sure to shut my trap and ask questions that would make them talk. I loved their accents, but ended up loving their warmness even more. I wish that we could have spent more time together. My many thanks to Feuza for setting this up. She followed her photographers instinct and because of that I have 2 new friends. Christine and Iaan, I hope that our roads cross again. Rock on guys! By The Way: This shoot taught me to follow my instinct and approach people with confidence. There have been a lot of times when I see people that I want to photograph. A simple question to photograph them might turn up into a great time. I have known David and his family for a handful of years now. We both have toddler-aged daughters that are BFF's and have known each other since infancy. My wife and David's wife are friends as well. You can probably guess that we are pretty close. David is the kind of person you want to know: extremely loyal, funny, smart, and a huge U2 fan. He also posses an insane amount of movie and music knowledge. He KNOWS this stuff inside and out. I kid you not. I am always more than impressed with his knowledge of directors, producers, actors, plot lines, writers, performances, etc. I always feel like I can learn so much more about movies when I am around him... and I consider myself a "movie person." You can read his movie reviews on his site keeping it reel. By The Way: I loved that I was able to just use my strobes modeling light for this shoot. I should have set up a custom white balance though, as my colors were kind of funky out of camera. The high ISO shooting ability of the Nikon D700 allows for this kind of shoot.